Some thoughts at the beginning... This is a view of the Potomac River from my slip at the Quantico Marina. Don't let the blue skies and shimmering waters fool you, the shot was taken on a cold day in Feb 2005. As I stood there contemplating the picture, my mind was drawn to Christ's promise in John's Gospel. This said, can we consider a few things? "Me-monkey theology", would have us believe that God the Father is like some over-indulgent Grandfather/Santa Claus figure who blesses all the children of God for no reason and no particluar end, Outside of the fact that the blessings were "claimed" by the blessee. The God of Scripture is quite a different person and when he blesses us, He does so that we might in-turn bless others. God the Father causes "Living Waters" to flow from our lives that we might be instruments in His hands. 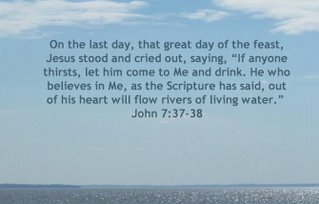 Unlike a restless sea that ultimately drowns all who fall into it, this Living Water satisfies and encourages our fellow believers. 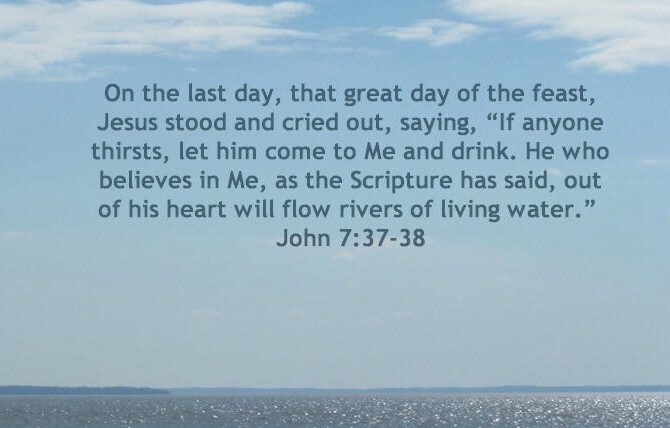 As it flows from our lives, it touches saints and in-turn, brings glory to the Father. This blessing allows us to participate in the grand opus of the Almighty as His grace flows through us into the graceless world that surrounds us. As we pray, let us ask the Father to make us a blessing to the household of faith, and the world around us. .